Almost every vegetarian is familiar with the big and round squash plant veggie - pumpkin. The vegetable is widely used for cooking in Indian kitchens as well. We make curries, subzis, soups, kebabs and even halwas with pumpkins. The vegetable has a thick outer covering, which encloses the hard pulp and seeds. 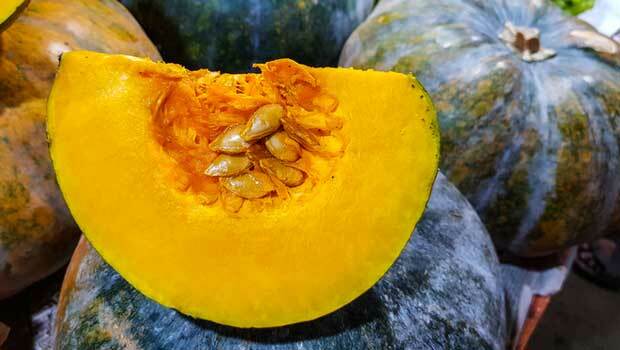 Known as kaddu in Hindi, pumpkin is a vegetable that comes with a whole range of health and beauty benefits. India is one of the biggest international producers of pumpkins, along with the United States, China, Canada and Mexico. They're quite versatile as well and can are ideal vegetables for those looking to lose weight quicker. Nutritionally, pumpkins are very rich and are devoid of cholesterol, sodium and fats. This is what makes pumpkins ideal for including in your weight loss diets. Pumpkins are used for their pulp, seeds and seed oils. They are baked into pies and cakes, added to smoothies and lattes, and even boiled, mashed and eaten as is for a quick, healthy snack. Moreover, the vegetable may also curb appetite as it is. There are a number of health benefits of pumpkins that make them great for weight loss. 1. Low In Calories: A 100-gm of raw pumpkin contains just 26 calories, as per USDA data. So, depending on your mode of cooking, you can pack in a whole lot of nutrition in relatively low number of calories. 2. High In Fibre: As per the United States Department of Agriculture, a 100-gm of pumpkin contains just 0.5 gm fibre. So, every cup of pumpkin contains about 3 gm of fibre, with just about 49 calories. Fibre is important for digestive health, which is not only key for weight loss, but it also curbs hunger pangs, eliminating the need for you to snack in between meals. 3. 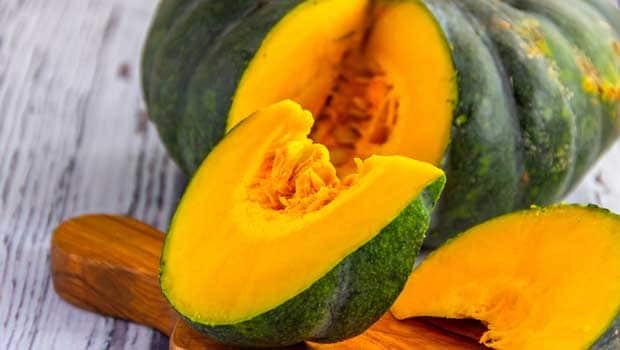 Great Post-Workout Food: The presence of a good amount of potassium in pumpkin makes it a great post-workout food that helps in recovery of the muscles. A 100-gm pumpkin contains 340 mg of potassium, which is higher than the amount present in bananas. You after sweating it out in the gym, you can binge on pumpkin to help your muscles recover faster. 4. Boosts Immunity: The presence of essential vitamin C and beta carotene makes pumpkin and immunity booster. Having a good and healthy immune system is important for a quick and healthy weight loss. 5. Boosts Mood and Fights Stress: Pumpkin contains tryptophan, an amino acid that is considered a natural mood booster, which also fights stress. An upbeat and positive mood is essential to help you stay on-course your weight loss and fitness regimen. 1. Lentils, Pumpkin and Cranberries Soup: With the satiating power of lentils and the goodness of cranberries, this soup is perfectly spicy and soulful. 2. 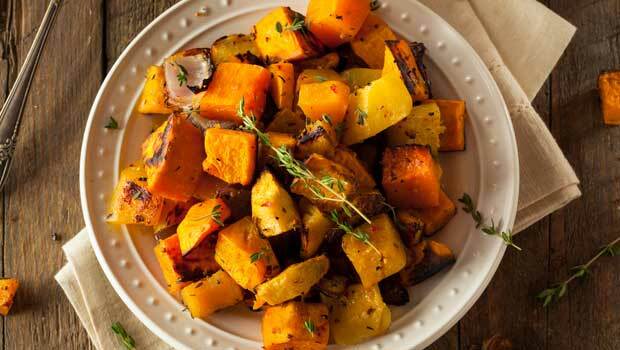 Baked Pumpkin Recipe: Flavoured with red wine vinegar, thyme, chillies and coriander, this baked pumpkin recipe is filling and delicious. 3. Spicy Pumpkin Hummus Recipe: With the goodness of roasted pumpkin, chickpeas, olive oil and cumin, this hummus recipe is sure to spruce up your evening snack time. 4. Pumpkin Soup Recipe: Good old pumpkin soup makes for an intensely satisfying meal, especially if you're trying to lose weight. Try this recipe today. 5. Khatta Meetha Kaddu: If you're an Indian food lover, this sweet and spicy pumpkin subzi is a must try. Spiced with asafoetida, fennel, cumin and tamarind pulp, this khatta meetha kaddu can add whole of lot of taste and nutrition to your lunch. It's important to keep in mind that no weight loss journey is easy and one diet cannot work for everyone. Therefore, it's imperative to eat healthy and exercise on a long term, in order to see results.